Often it is the simple things in life that make us happy. In the case of tools, often the simplest tools are the handiest and the ones we turn to the most. But can a simple adjustable hook really be a go-to tool? 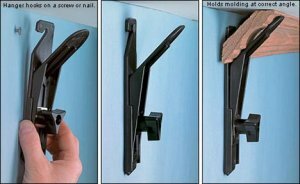 Well, I can't answer this, but the Crown Hanger System sure looks like it would be a huge time & money saver. Have you ever tried to install crown molding by yourself? It is almost impossible unless you have some kind of device to assist you. Some manufacturers offer fancy poles that help hold up crown, but those are still hard to manage with one person and can be expensive. The Crown Hanger System is just an adjustable hook, but it looks like it would work really well, and can turn a two man job into a one man job. To use the hook all you have to do is nail or screw the hook onto your wall an 1" or 2" down from the ceiling. The hook will hang off of the nail and can be adjusted to fit the size of your crown. You can then nail your crown to the wall, and when you reach the hook you can just slip it out; the nail will remain hidden behind the crown. The Crown Hanger will hold crown at 45-degrees, but can still work with crown that sits at other angles. The Crown Hanger costs about $10 each.